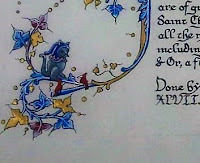 After calligraphy heraldry is probably the most common motif I include in a scroll. Whether it's a recipient's arms, the order's device or the Calontir banner I use them somewhere. Even if the recipient's persona came from a culture that didn't have heraldry. When I receive a scroll assignment I first collect as much information about the recipient as I can, even prior to receiving the text. For their personal heraldry, I go to the Calontir Kingdom's Armorial populace web page, click on their name and copy both the image emblazon and its blazon terms. I save the emblazon as a picture in my word processor, sometimes copying it in several sizes. I add the blazon in case I have to ask a herald a question later, such as the difference in an animal's pose. I need the proper "heraldeze" so they know the device I want to paint. Heralds are well versed in the terms. 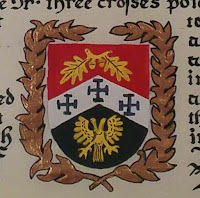 Or, I may want to look a charge motif up in a book and will need the blazon to do that. Blazons are written in a jargon derived from the Norman French language. The best place to look for information on this is in a good heraldry book, such as A Complete Guide to Heraldry by A C Fox-Davies, Heraldry: Customs, Rules and Styles by C A von Volborth, or Heraldry, by Henry Bedingfield & Peter Gwynn-Jones. 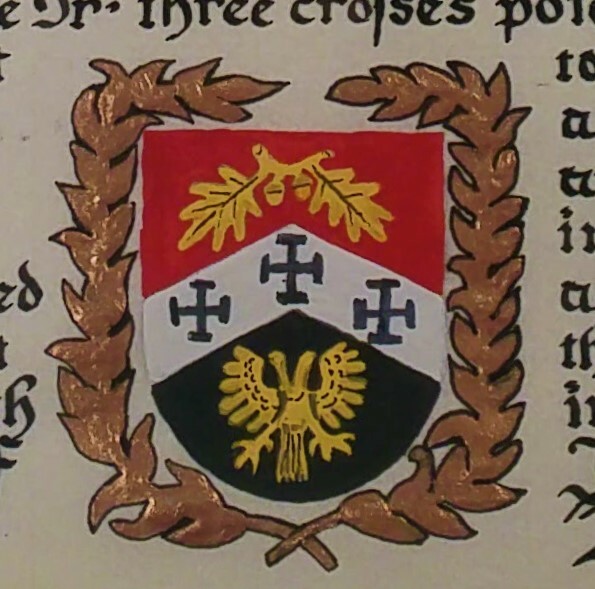 I recommend every scribe eventually have their own introductory heraldry book. Until you get your's your local herald will gladly help if you have questions. You may also find your answer in Wikipedia's Heraldry Portal, although I don't know if it's SCA legal. 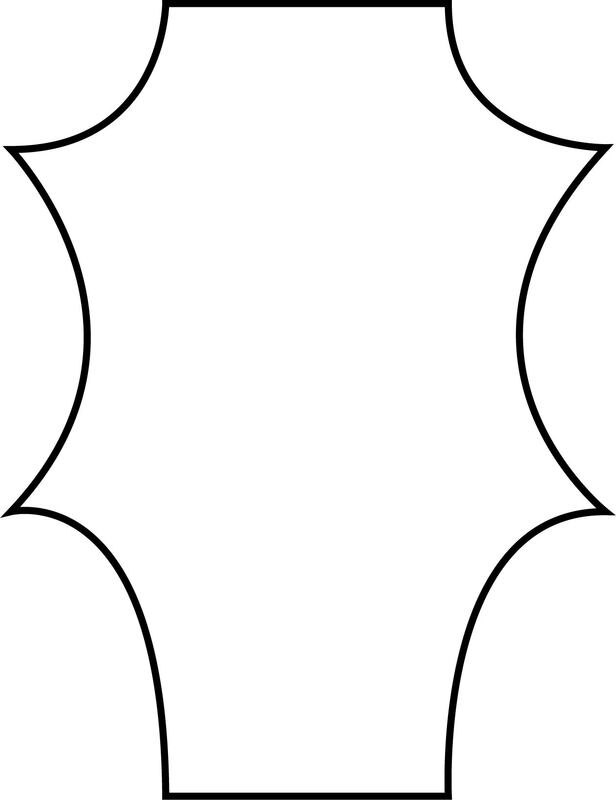 When I plan a scroll I consider the shape of the shield and if I'm including the helmet, crest, and supporters. I want to know how they should appear. Depending on the recipient's rank the heraldic achievement may be displayed with its supporters, coronets, and helm surrounding the device. These sumptuary items are protected by various Kingdoms' laws. Heraldic Achievements' use is detailed in Calontir's on-line 14th edition of Kingdom Law Appendix III-322 HERALDIC ACHIEVEMENTS. The standard heater-shaped shield is SCA appropriate for any scroll but technically came after the 12th century. Also in period, women displayed their device on a diamond shaped shield called a "lozenge". 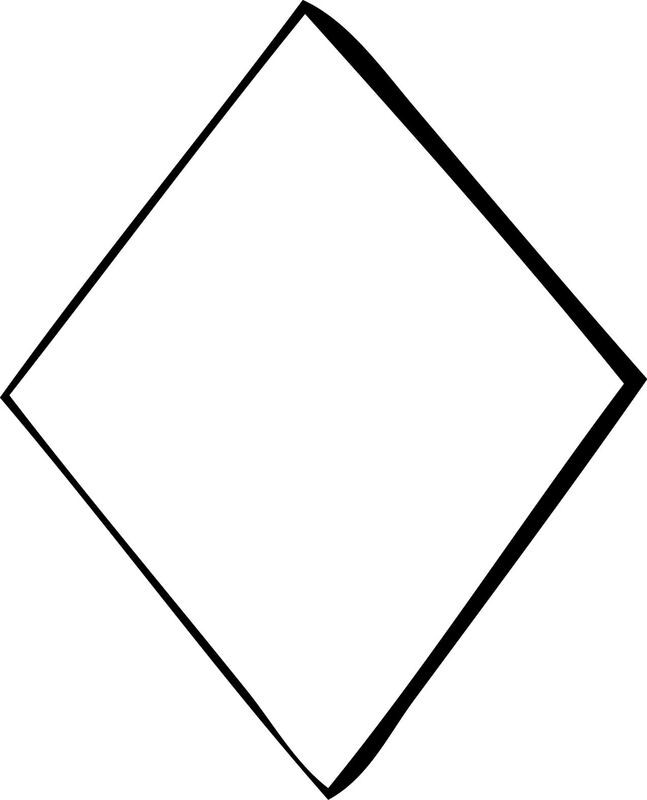 Women in the SCA entitled to display arms may use a lozenge or a heater shape. Most in the SCA, but not all, choose to use the traditional heater. If I can easily check on the recipient's preference covertly I do. If I can't do this stealthily I use a heater shape. Only a few colors called "tinctures" are used in heraldry. Originally chosen for their visual contrast and easily identified from a distance. The paints I use for heraldic "tinctures" provide strong, bright unambiguous colors. I lay out the whole scroll design lightly in pencil first, including any arms. I check that everything’s there that's needed and it's balanced. Depending on the device I may trace the arms or elements from it if they are more complex than I want to sketch.--Tracing is period.--I also want the charges to "fill" the shield's section in which they're placed. They shouldn't appear lost in space. I use a ruler, set square, compass or stencil when possible for best results. I prefer a "roundel" appear as a circle than my almost round freehand drawing. I don’t trust my eye for something that basic. I paint the device in flat colors with distinct outlines, usually using a small Micron pen or 000 brush. A pointed dip pen works well too. I don't highlight, shade or do extensive details. I use black paint to outline unless the charge is very dark, then I use a white gouache. The white may need more than one coat to be opaque. I do shade and highlight any helm, mantling or supporters. Outlining makes the shield and its charges more distinct and provides a finished look. Decorative Heraldry Taking heraldic art to the next level. I like heraldry for its dramatic decoration and artistic design. I search "Extant Heraldic Display" Pinterest boards looking for it's use in period manuscripts and extant medieval items. Illuminated manuscripts are rife with heraldic art to filch. I use shield shapes on scrolls to suit the recipient's country, era, and gender. For some styles, a specific shield shape adds to the scroll's persona consistency. A round or rectangular shield suits a 9th-century Celtic persona, a kite shape is appropriate for a 12th-century Romanesque scroll, and a “horsehead” fits Italian Renaissance. Sometimes I slant the shield.--For authenticity I'd note, doing so on arms in Spain or Portugal indicated bastardy.--I enjoy playing with the swooping mantling which can be painted realistically or as tattered swirls. I've painted shields hung by a strap from a louping ivy bar. Using the recipient’s own helm can be a nice personalized touch, especially if you spruce it up with a bit of ornamentation. Depending on your Kingdom's law and the recipient's rank, supporters provide creative fantasy possibilities. I've painted a shield held by the recipient's favorite cat. I've seen them hung around a stag’s neck from a strap. The possibilities abound for decorative supporters and ideas are rife in period sources. Another period technique is to repeatedly scatter copies of the recipient's charge, badge or a variation throughout the border. Motifs such as award badges, Pelican blood drops, Fleur-de-lis, Laurel branches may also be used. I've included their motto when I know it, although this may be limited in some Kingdoms. I've included humor when I can, such as the two cardinals that refer here to the recipient's favorite baseball team. Heraldic art is valuable for scroll creation and most scribes become competent with its patterns, execution, and terms. It enhances the pageantry and beauty of any scroll you create.